Though I adore gardening and am seeking to develop my skills in the area of composting, it is definitely a weak area for me. I love taking a peak into what others are doing as I learn more about it, because I know it will be so valuable for my garden in the long run. Laura has decided to give us a glimpse into her own process, and she’s told me that she is hoping to continue to blog about her composting project as it goes on, which I look forward to reading about! Before I get started, I just wanted to say, “Hello!” to everyone, especially Stephanie and that new little baby in the world! What a joy and a blessing. I’m praying that this will be a wonderful time for the whole family. I also wanted to say, “Thank you,” for the opportunity to ‘guest blog’ on her site! I so enjoy her writing about natural living, homemaking, frugality, etc., all from a Christian viewpoint. My name is Laura, a.k.a. Farmer Gal. For more information about me, please visit my blog at www.FarmerGalsMarket.com, and if you like what you see and read, please keep checking in! As a disclaimer, I must tell you that I am a fledgling in composting. This is a process that I have just begun and thought it would be fun to share. If you’re here to learn expert tips on how to compost, you may want to look elsewhere. However, if you’re even slightly interested in compost and sharing a slice of my life along the way, you’re in the right place! About two three three and a half months ago (where does the time go?!?) my husband, two small children and I moved from Colorado to Minnesota to live on his family farm. At the time I joked that we made the trip ‘ark style’… The two of us, two children, two dogs and two horses. About a month after we arrived on the farm, I was contemplating life while doing one of my favorite activities… Scooping horse poop. I’m actually kind of serious. It’s kind of like meditation and exercise combined… My mind has a chance to become quiet, it’s a good workout for my body, and it brings me closer to the earth and nature. I know, I know… Manure may be a little too close to nature for some of you out there, but for me it just works. We had moved our horses onto a different pasture, so I was out scooping away so that the piles wouldn’t kill the grass underneath and allow it to grow back while they were off it. As I scooped and filled my first wheel barrow, I started thinking about all of this poop and how there must be something we could do with it, which quickly led my thoughts to composting. After a little online research I found out yes, indeed, horse poop (combined with other ingredients) is a suitable material for composting. It was then that our first compost pile was born. It was also then that Stephanie put out a request for guest bloggers while she was enjoying time with her new baby, and I thought her site would be a great forum for me to share my composting adventure, so I volunteered and she graciously obliged. From then forward, I had grand intentions. My husband and I were going to build the compost box to beat all other compost boxes. It was going to be large enough for a tractor scoop to slide in and turn it. It was going to be anchored into the ground for support. Somehow some old, huge, heavy bridge planks that were in the shed were going to be implemented. In the meantime, life happened. By life, I mean our normal routine of raising two little ones and my husband working, the drawn out process of moving onto the farm and moving his parents off of the farm, dial-up and/or no internet access, a nasty cold for all four of us, and…. (shudder)…. poison ivy for my husband and I, which was especially nasty for me personally. We continued to add material to the compost pile, but building of the box went to the bottom of the priority list. Thankfully, we’re all healthy again and a lot farther along in the moving process than we were even a month ago, but we are still very busy. I knew I still wanted to get this compost box up (I’m hoping I can use it in some garlic beds this fall) but I needed to do it much more quickly than our previous plan of anchors and bridge planks entailed. I started thinking about the concept of frugality and how it can also apply to how you use your time. I had a project to accomplish, but I had minimal time to do it, so I had to streamline my goals and methods. 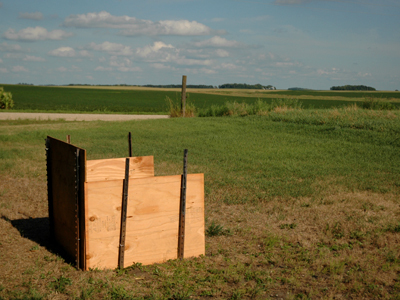 Instead of the ‘Goliath’ of compost boxes, we ended up with more of a ‘David’… Old t-posts that were here on the farm, some leftover plywood from the construction on my brother-in-law’s new house, and some fencing wire. It may not be the most beautiful compost box, but it’s going to get the job done, and I feel perfectly content with that for now. So that’s the long version of how we have begun the composting process. Next time I will share with you how we slapped together constructed the box, the reasoning behind the materials we are putting in it, and some online sources that I have found useful. Down the road I hope to share the fruits of our labor and how we end up applying the compost, and some pretty pictures of the finished product, all from our happy little ‘David’ box. 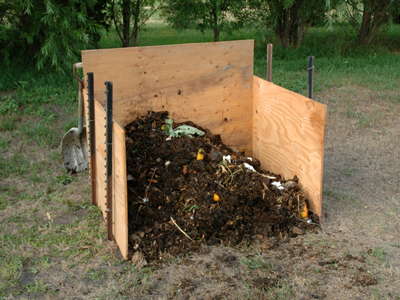 Ladies, please tell us about how you do your own composting… what type of box or pile do you use, how did you set it up and how is it working for you? You can visit Laura at her blog, Farmer Gal’s Market! I finally broke down and purchased an composter instead of building my own. I used our tax refund so I feel that really pushed the government toward greener pastures! I have two very inquisitive dogs and I live in the city. Out of fear of rats and doggie play time, I found one that is sturdy and does not allow oder to escape much. I love it! I have not been at it that long but it is coming along and I am hoping by the time I put in my fall beds I can add some homemade compost to it. Thanks for the post! We started composting in March by drilling air holes in a industrial trash can. It’s been a great way to “cook” some compost in the city. We are long time composters but I have never been very scientific about it so it has been a slow process. This year my hubby took an interest and has done much better with the whole thing. He went to a two bin system so that we have one “cooking” and one that we are building. He made sure the layers went in green-brown-soil. The first one he put quite a lot of time into modeling after one he saw in a book. There are long pieces of rebar in the corners that act as hinges for layers of 2x4s. The second one he attached to the side of the first and used three pallets tied together at the corners to make up the other three sides. It’s not quite as cool but wroks just fine. We started composting 3 years ago, and it is so easy. We took the lazy route and started throwing things in a pile in our yard. 🙂 I throw all produce scraps, egg shells and coffee grounds out there. My husband throws yard clippings, weeds, and leaves on it. He turns it 2-3 times in the summer and we rarely water it. We don’t pay attention to any specific layering, we just throw what we have when we have it. Guess what? It worked! There is no smell, and the black, rich compost that we dig from the bottom for our garden beds every fall and spring is awesome. Please don’t overthink it, just do it! I made a double compost box (two, side by side, each about the size of the one pictured) by simply wiring old pallets together. I also have a pallet for the front of the one we are currently loading. Then when it is time to turn it I simply move the pallet door over to the other side and flip it into there. It has actually worked quite well and it was easy and free! I have 4 composters, all the plastic ones since I bought one from the town and the other 3 were at this house (empty) when we bought it. They work okay…but I wish I could find the time to turn them. Been thinking about that a lot and need to “schedule it” so it gets done!